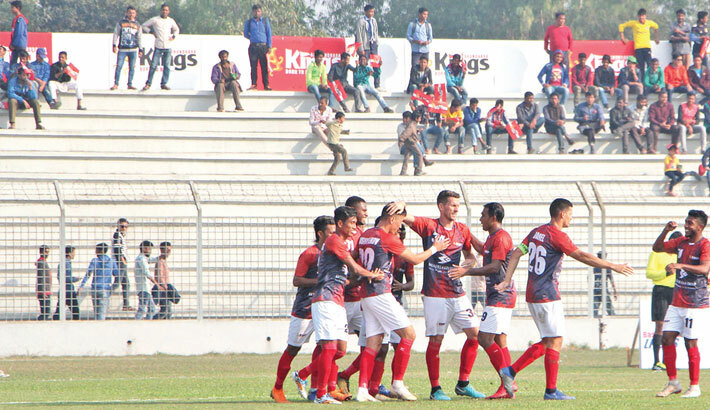 Bashundhara Kings’ chariot is blazing through Bangladesh Premier Football League as they smashed NoFeL Sporting Club by 2-0 goals at their home venue Sheikh Kamal Stadium in Nilphamari on Wednesday. Local boys Motin Miah and Emon Babu propelled Bashundhara Kings to the sensational victory with breathtaking goals. Bashundhara Kings started off with their characteristic proactive style of play as they made a couple of sneaky attacks on NoFeL’s defence. Soon enough, NoFeL’s defence started to give in on the face of repeated incursions of Kings’ forwards Daniel Colindres and Bakhtiyar Duishobekov. But NoFeL defenders were taken by surprise as Motin Mia broke the deadlock on the 23rd minute of the match. The goal portrayed the potency of Kings’ local midfielders who were brilliant in getting the job done. Kings continued wreaking havoc as NoFeL brilliantly defended their D-box for the remainder of first half as they didn’t concede any more goals. NoFeL tried counter-attacking in their attempt to slow-down the rampaging Bashundhara forwards but that didn’t bear much fruit for them as Bashundhara Kings doubled their lead on the 85th minute of the match sealing the deal for the men in reds courtesy of a piercing long shot of Emon Babu some 30 yards from the post. It was a procession of brilliant attack which led to the stunning goal. The first of which was launched by domestic football sensation Tawhidul Alam Sabuj who spanked a volley from the edge of the danger zone which was acrobatically fisted away by NoFeL goalie. The deflection was picked by Bashundhara’s Brazilian ace forward Marcos Vinicius who attempted to back paddle the ball into the post. Despite being grounded, the goalie gathered himself and kicked the ball back into the game. This time it was Emon Babu who received the ball from some distance. He rid himself from a trailing defender with an oscillation and bulleted a screamer into the post giving sealing the fate of the match in favour of Bashundhara Kings.